I think this is probably the best thing a player can learn to do. And I don't mean, like a robot, that you follow the 80-90 percent rule. I don't even agree with that. What I mean is that you should follow your instinct that tells you you're beaten, and be okay with cutting your losses and moving on to the next hand. This implies that you're in a hand, post-flop, and you've made some calculations and good assumptions about your opponent(s) along the way. Did an opponent make a big bet? Did they raise you? Why did they do that? Do you even have good pot odds? Chances are, they've got something and you don't. So, fold. Move on. Instead, get into it when you're on the other side of that situation. Don't worry about being bluffed off of a pot. Just move forward. well, you don't earn money only by making valuebets or bluff but also by making good folds. To improve that part of poker you just have to work a lot, especially work on understanding ranges on different positions in particular situations. Agreed Bellicoso! A poker player has to look for confortables situations. Its not a shame fold an AK for example, if you dont hit a pair! Dont lose money is also a victory. That's a great example. I have seen a lot of people ride AK to the end without ever pairing. Just let it go, man! We're all guilty of this. The trick is to follow those clues I mentioned. If you know your opponent isn't a maniac, and they're betting/raising you, get out of there! Of course, it's important to learn when folding your cards. It does not need to be too tied to your cards and thus put yourself in an unpleasant situation. Sometimes it's a smarter game to run than to finish up and make a mistake that can cost us a bit later in the later part of the tournament. In cash games a penny saved is a penny earned but in MTTs you have to gamble a lot. That's true, you do have to gamble. However, you can be reasonable about when to do it and how to follow through. I recently posted about my playing style (very aggressive) in the Online section. While it's not without risk (or trash-talk from "good" players), it allows you to capitalize on a lot of hands. Still, the "learn to fold" rule applies. 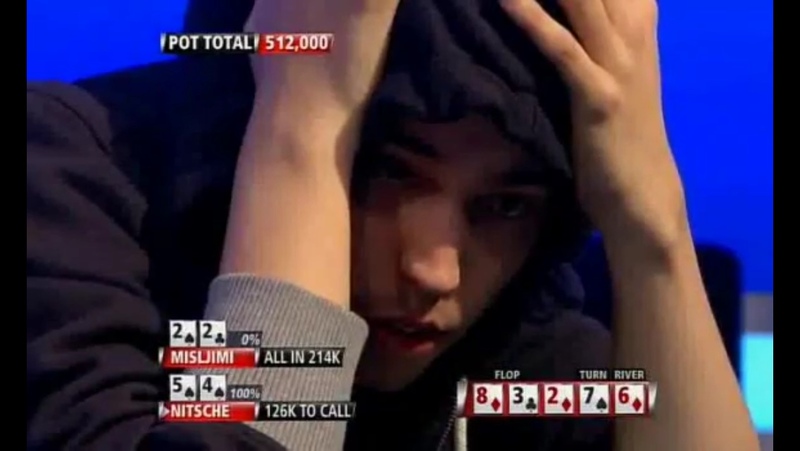 Post-flop, you've got to do some analysis and be willing to let go of your losers. I think what it is really important is that you you have a balanced range, for folding, betting and raising to become tough to play against. Of course there are a lot of players out there who just don't like to fold and if you adjust to their game it becomes pretty easy to exploit them. GL! This is a great skill to gain. Folding in big spots lately has definitely increased my ability to go deeper in tournaments. I have noticed that often times when players bet really big on the river but not at all before hand they often have a good hand easily enabling me to find a fold. IF I don’t have a top hand I am finding the fold. A very skilled played once taught me that it’s better to fold and find a better spot than go broke with a medium hand. Even if I’m ahead it’s not worth it in the long term. If I think I am definitely ahead obviously I am going with my gut instincts. Being able to fold a good hand knowing there is a high chance you are losing separates good players from the elite. Totally agree. Once you learn this, you've leveled up a bit. such an excellent statement and good advice im sure most including myself could follow a bit more. Half your game in my opinion. Learning to cut your losses is as important as extracting as much as you can on your won hands. I used to have a local card room that played Omaha hi/lo. Was a great game for me early on because it taught me how to fold big hands. Hi, good advice but I must disagree with all respect in some aspect, very rarely in poker you will find that you have a 100% winning hand and you can reach extremes (I do not say that you do) for example: you have 8h8c and the flop is 8s6s5s, the turn is 8d and the river is 4s you have poker but it is not 100% sure that you will win the hand, I mean with this extreme example if you start to question more than normal you can lose good hands, so that's why I think from my point of view that it is important to know your opponent and how you say to consider your hand and see the success percentage that you have but not to doubt everything. I agree, the more I play this game the more I learn to fold. Folding is the biggest skill in poker - i dont care what anyone else says, it tests self discipline, it factors in a thought process that says you have considered all other possible factors, board texture, your hand and much, much more. Learn when to fold, chek or bet...but remember, you need to learn to play solid poker first! In micro stakes 9/10 times players are representing what they have , so if you are alerted you can easily find the fold button. In higher stakes fold and pot control are 2 weapons players use a lot. They don't go so often to a showdown unless they have both strong hands(or bluffcatching). Whenever I run deep in a tournament I vividly remember my nit folds because I always try to eliminate the high variance spots from my game. Otherwise you can be one of those bad beat story tellers. Very true . To be profitable you have to minimize your losses as well as maximizing your wins . And folding is an important part of that . I do my best not to fall in love with any hand , no matter what it is . Gotta fold em when you know you're beat . Good advice and good luck . Would you throw off like Dominic Nietzsche? In 2010 . Very good advice! I totally agree. Folding is an important part of the game that goes unoticed. The part where it get difficult is folding during the river when before the flop and during flop and turn your ahead then river hits and it changes the complexion of the board and your opponent bets huge forcing a fold. lol, but really though - the amount of times I find myself going "oh man, this is such an obvious value bet from these hands that beat mine" and calling anyway.. I'll plug that leak someday! I think some of it is people adjusting to better players - a lot of people start off on the play money tables (where it's barely even poker), move on to freerolls/micros and still play like maniacs. Is a very good tip for a beginner who tends to get all in when he comes into play. Lasting patience will eventually be rewarded. In life, it is said that you are the master of your own destiny. In poker, this can also be true - at least to a certain extent. Yep. Even if you got AA or KK, which are incredibly hard to fold but if you feel like beaten then you gotta fold even these beast of hands. You gave an example of when making a fold is no possible, a more realistic example can be given when you have a pair of A, and you see three suited cards with an ace on the flop. In this situation it will be really difficult to fold after raising of opponent, especially before the bubble or when playing ITM. Naturally, for making a decision in this case, the most important thing is the understanding of the game of your opponent based on his previous game at the table. Intuition and hope for a miracle should occupy the last place in the decision - fold or call. So what hands do you fold? Well, you need to determine what starting hands are in your range and the positions from which you will play them (late, middle, all). This will ultimately depend on your playing style, but anything not in this range/position is an immediate fold! Don't bother paying to see the flop, there's no point. You don't like those cards, remember? Also, don't deviate. Stick to your game plan. Only make adjustments if you find mistakes or legit missed opportunities. This is one of the most important commandments of poker. It is better to lose a little but stay alive in the game. Yeah it is easy to fold on the start of the play when you have equally money as others but what about when you see the turn with AQs and you missed and get raised by the guy who is just characterized as calling station and you are just sick of him? Folding, especially a good hand, is such an undervalued skill and is one of the key markers between good and great players. I always tell myself "it's free to fold" unless you're paying the blinds or there's a huge ante every time. It s happening all the time that I can t fold AK AQ or AJ KQ KJ or QJ up to the river, and most of the time I loose lot of chips bicause of that.How can I learn to fold the relatively good cards? Your size and amounts of bets or calls relative to your stack should leave you a folding option if there is any possibility you might have to fold the hand later. In essence, that means plan early. I plan for my folds before the flop, before the turn, and before the river. Then I balance that with what I want to achieve in the hand. That means always knowing what you are risking and being willing to walk the line you choose!!! No doubts no second guesses. Maybe you have to check your odds when the hand is over, but learning that accumulates and you make better choices with each play. The best thing about it is that you start to develop a "good feeling" when you do a good fold and get to see the opponents hands after. As opposed to the "almost got slaughtered but didn't feeling". If you don't have that "good feeling" where you have upped your game to avoid these terrible plays, but instead have that "didn't get slaughtered feeling" you will likely get slaughtered in the future because you haven't realized why you folded yet. Learn to plan for the fold, then you get the "good feeling". Balance it with what you want to achieve and depending on how everything plays out, you could be winning or folding and always feeling good about your hand and the way you played that. You just need to learn to break the habit of chasing your hands to the river. As a general rule, it's best to prepare to fold if you didn't match anything on the flop. I rarely play them to the turn. I just accept my loss and prepare for the next hand. Just start trying to develop this habit and your game will turn around. I think that is the thing that every poker player must learn to be succesful. I agree with you. Perhaps this is the most important thing you can learn to use effectively. Obviously, without the ability to fold, the player will not be able to succeed. Folding a good hand is a big boon in the poker career of a player. Folding at right times gives you a tremendous opportunity to reach at the final tables of the tourneys. Folding saves your stack from potential damage. It is an art which comes from discipline and experience. watch this hand where I folded Q Q to save my stack in a CC tourney which help me to finish at 3rd position later.